Every blogger wants to make good amount of money right. A blogger can earn money by providing services, selling digital products, affiliate marketing, Link Sales, Adspace Sale etc. So today I am going to focus on Adspaces. These adspaces generate a large amount of money for a blogger. You can add an image/notice on the desired space you want to sell and people may contact you. Well this makes it the space look quite dull and boring so here I will show you how you can add Awesome Advertise Here Text Widget with really cool hover effect to your blogger blog. Once you have seen the demo, to add this widget to your blogger blog follow the below given step. After adding the code change #link with the link of the page you want your visitors to be redirected to. You are done now. 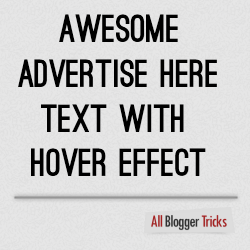 Now you and your visitors can see this Awesome Advertise Here Text with Super Cool Hover Effect in your blogger blog.